Snowbirds: Snowbirds aren’t really birds at all but people who migrate to the Phoenix area (and other parts of the Southwest) to escape the harsh winters of their northern home. Typically retirees, they come to a warmer clime and look to do the things they love. While not everyone has the same schedule, snowbird season is usually from October or November through April or May. In Phoenix, where I live, my ringers return mostly in mid-October and leave just after Easter. The challenge is to find these birds and put them to ringing. Another challenge is how to utilize the birds that fly in for a shorter period of time. 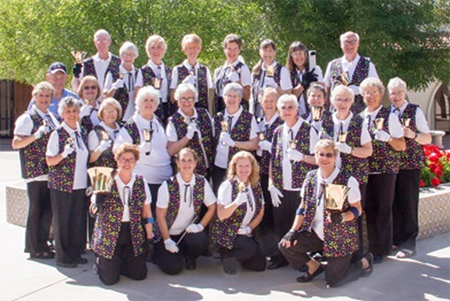 In my Sun City community choir, Handbell Ringers of Sun City http://suncityaz.org/recreation/clubs/handbell-ringers/ our board has established a “must arrive” time in the fall. We do allow them to only ring one season (Fall or Spring) if they can’t arrive or stay for the concert dates. We are a non-auditioned group, but are fortunate enough to have 3 sets of bells. So we ring a double 5 octave choir which makes it a little easier to have all the parts covered when some ringers arrive later or leave earlier. We do require that if you ring with us, you make at least one concert and 80% of the rehearsals. Whereas some groups utilize substitute ringers, we do not. We ring at Level 3-4, and it is hard for someone to walk in and ring. This group is also allowed to take their bells home to practice, so we might not have extras. If a bird isn’t comfortable ringing at our level, we keep a list of churches that have bells to refer them to. Every group is different and each has to decide what works for them. Church groups are a different flock. We ring from mid-September (our first church presentation is October) to after Easter. I have ringers that have rung with me for years. Sometimes they get back early, and leave early and other times not. I believe if you have been in my choir, those bells are yours and I will not give them away. This IS where I employ subs. I also try to pick my music, at both ends of the year, to fit those I have in my choir at that time. For those that endure the summer heat….I have pulled out 8 bell music. I also retreat to the mountains in northern Arizona for the summer, so one ringer in the group leads it and they don’t use an arm waver. They played twice last summer, even though they were hesitant, and did a great job! This also keeps bells in the minds of the church members and keeps the ringers, ringing. It is important to feed the other birds too. How do you find and keep snow-ringers? Keeping is usually easy. Most ringers just want to ring and always contact me about coming back. I also have email lists to let them know what’s going on. Ringers seem to flock together and become a family, so they stay connected. Finding birds is a little harder. With social media, however, it has become easier. Our websites have pages about the bells and all you have to do now is google handbells in (your city), or visit the Guild website, http://handbellmusicians.org/events-networking/handbell-networking/handbell-choirs/ and information pops up. Of course in the Senior Communities, word of mouth is vital also. If your group is “full”, hook the ringers up with other churches that have bells. Most churches don’t require you to be a member to ring with them. This is where the Area websites, http://handbellmusicians.org/area-websites/ and your regional rep. comes in. They can help you find resources. As a director, I believe it is very important that once you find the ringing birds, you let them know your expectations. It also helps to let them see the music you are ringing. They may come from a beginning choir and not be able to ring your music, or vice versa. And you definitely don’t want to turn them off or discourage them. It’s kind of like parenting….some things work for a while, then you have to try something different. Good Luck! Are there any definitive solutions to this situation….no….but you just keep flying along. Libbie has been an active member of Handbell Musicians of America (American Guild of English Handbell Ringers) since 1985. Activities include being a Board Member for Area 11 for five years, participating with Distinctly Bronze West since 2009, teaching stroke workshops throughout Area 11, directing a Community Choir since 2009, church choirs since 1985, and ringing in Saguaro Bell Ensemble since 2015. She has a B.S. in Music Education K-12, both choral and instrumental and has taught in all levels of public and private schools. Outside of music, Libbie is a Master Trainer in outdoors for the Girl Scouts in Texas and Alabama, was Associate Director for a Hands On Science Museum in Illinois, and currently spends her extra time at the World Wildlife Zoo and Aquarium in Phoenix. Hobbies include quilting, needlework and scuba diving.